The Simpsons, with their bulging eyes, huge overbites and unique anatomy, are obviously a species of their own. 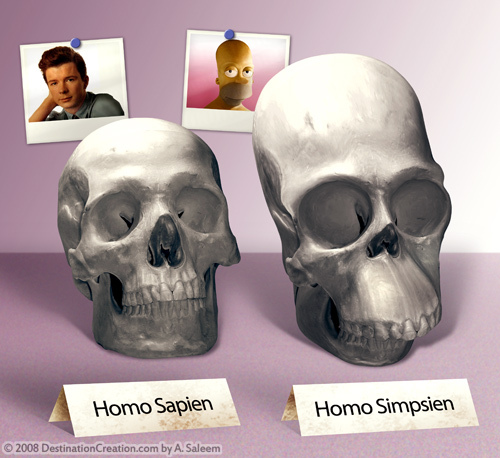 While we are familiar with their external appearance as illustrated for their on-screen cartoon environment, here’s a look at how a Simpsonoid skull would look in the real world, as compared to a human one. v cool image and love the homer pic in the back! Cool and very creative work! pouvez vous me faire en simpsons? Should have called it a “homer sapiens” instead. Makes more sense. No, rob. ‘Homo’ means man. ‘Sapiens’ means wise. The simpsons are a type of human, but I draw the line at wise. I’m kind of worried at the idea of Rick Astley being used as a definitive example of our species, though.